Technicians ready the Orion launch abort vehicle for a May 6 test at the U.S. Army White Sands Test Facility in New Mexico. WASHINGTON — An aerospace company building the astronaut escapesystem for NASA's new Orion crew capsule has warned its subcontractors thatfunding for the project will dry up today, according to industry sources anddocuments. The announcement comes on the eve of the first test of theso-called LaunchAbort System, set for May 6, and two months after the proposed cancellationof NASA's entire Constellation program — which includes the Orion spacecraft — in February. In an April20 letter to Minneapolis-based Alliant TechSystems (ATK), one of twocompanies developing motors for the Orion Launch Abort System, the Orbital SciencesCorp. of Virginia said Orion prime contractor Lockheed Martin Space Systems ofDenver would restrict funding for the effort by April 30. "Orbital Sciences Corporation is in receipt of a noticeof funding limitations from our customer, Lockheed Martin, that no additional fundsare forthcoming for the remainder of GFY 2010," Gregory Pappas,subcontracts manager at Dulles, Va.-based Orbital, stated in the April 20letter to ATK. "As ATK is aware, the current run-out date is April 30,2010." In the letter, Pappas asserted that the lack of funding forthe Orion Launch Abort System "does not constitute a Contract termination,"which would violate a law passed in December that prohibits NASA from using2010 funding to cancel any contracts or activities under its Constellation program. Constellation encompasses the hardware NASA would need toreplace the space shuttle and return astronauts to the moon. These includeOrion — designed to transport astronauts to the International Space Station andlater to the moon — as well as its Ares I rocket and the Ares V heavy-lift booster. NASA's three aging orbiters are due to retire in the fallafter three finalshuttle missions (in May, September and November) to end nearly 30 years ofreusable shuttle flight. In February President Obama proposed canceling the Constellationprogram, including Orion, in his $19 billion NASA spending request for 2011.But in an April 15 speech at NASA's Kennedy Space Center in Florida, thepresident spared the crew capsule from the ax, calling instead for a stripped-downOrionvehicle to serve as a crew lifeboat in the event of an emergency at thespace station. Although the move is viewed as a reprieve for LockheedMartin and its Orion work force — scattered in states across the country butprimarily concentrated in Colorado, Florida and Texas — as a crew-rescuevehicle it will launch unmanned, leaving no need for continued development ofthe complicated and costly Launch Abort System Orbital is developing with helpfrom ATK and Sacramento, Calif.-based Aerojet. Julie Van Kleeck, Aerojet vice president for space programs,said the company is aware of the funding restriction for the Launch AbortSystem and is shifting employees internally rather than issuing pink slips. "We've been notified by Orbital," Van Kleeck toldSpace News Tuesday. "But there's a lot of restructuring going on in lightof the president's speech. We're in the process of reassigning people for now.We're hoping it's temporary." In addition to developing the jettison motor for Orion'sLaunch Abort System, Aerojet is providing propulsion systems for the capsule'scommand module and service module. "That's continuing," Van Kleeck said of thecommand and service module propulsion work, adding that the company does notanticipate layoffs as a result of funding restrictions on Launch Abort Systemdevelopment. "We're conserving funding so we're going to be ramping theteam down and awaiting further direction." NASA and Lockheed Martin are preparing to modify the Orioncontract in light of the different requirement set associated with the capsule'sscaled-back mission. 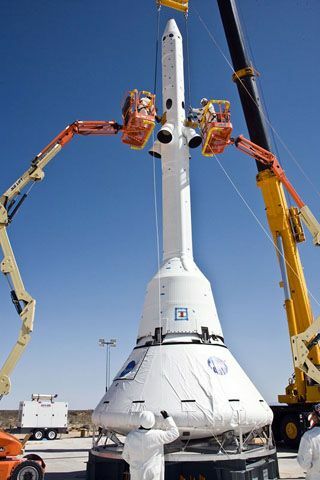 Nevertheless, in an April 23 letter to Lockheed Martin,NASA reminded the company of its contractual obligation to set aside 2010 Orionfunds to cover termination costs in the event the program is canceled in 2011. "Previous to the letter, this was being coveredoff-contract at the agency level," Cleon Lacefield, Lockheed Martin vicepresident and Orion program manager, said in an April 23 internal e-mail to theOrion team. "The letter changed NASA's direction and is nowrequiring us to cover this contingency cost on-contract with current funding. NASAhas not yet provided the additional funding for the full termination liabilitycontingency," Lacefield wrote. "We are working very hard with ourstakeholders so NASA will provide the necessary funding or otherwise resolvethe issue so that it doesn't impact our team's performance. In the interim, we'regoing to hold procurements to minimize impacts to the team." Lockheed Martin would not comment on the status of its Orionsubcontracts but said the company is continuing to work with NASA torestructure the program and provide a crew-escape vehicle for use aboard thespace station. "We are encouraged that the Administration recognizesthe progress that Orion has made and that a decision has been made to leverageOrion's innovative technologies and unprecedented safety to provide near-termcrew rescue capabilities for the International Space Station," LockheedMartin spokeswoman Linda Singleton said via e-mail April 27. "The Orion program continues to work to the [fiscalyear] 2010 operating plan and we look forward to working with NASA to refineplans for supporting the InternationalSpace Station, and to developing an inspiring and sustainable human spaceexploration architecture for the nation with the Administration and Congress,"she added. Industry sources said Lockheed Martin funding restrictionswould not affect a flight demonstration of the Orion Launch Abort System atWhite Sands Missile Range in New Mexico on May 6.